I really enjoyed D.R.E.X. Blackout. The X-files fan in me was screaming “I want to believe!” as I dove headfirst into a world of secret (government?) agencies, superhuman / supernatural creatures, and the fight to save mankind from annihilation. As a main character, Matt was immediately likable. Following the murder of both his wife and daughter, Matt is convicted and sent to prison. He didn’t do it, of course, and before he can be transferred to lockup, he is mysteriously exonerated and set free. The people behind his sudden change of fortune are none other than D.R.E.X. Before he knows it, Matt is sucked into their organization. To his thinking, he’s there for no other reason than to find those responsible for murdering his family. But the leader of D.R.E.X. may have other plans for him. I really enjoyed Ms. Bennett’s tale. She did a great job painting a picture of a shadowy government agency, one we know we shouldn’t trust but are forced to regardless. Matt’s new D.R.E.X. teammates (Ryan and Lyndsay) were great characters too. What kept me from giving this a full five stars were a few editing issues and a major timeline glitch. At one point it’s mentioned that Matt’s wife contacted her old boss at D.R.E.X. ‘a few days ago’ yet Matt’s already been found guilty of her murder at trial? You & I both know murder trials take a little bit longer than that! In the grand scheme of things, I really enjoyed this book. Clearly leaving room for more D.R.E.X. exploits in the future this story concludes nicely, with no cliffhanger. Fans of sci-fi, horror (although the horror element here is mild IMO), and secret agency stories would be well-served by this book. If you’d like to check out D.R.E.X. 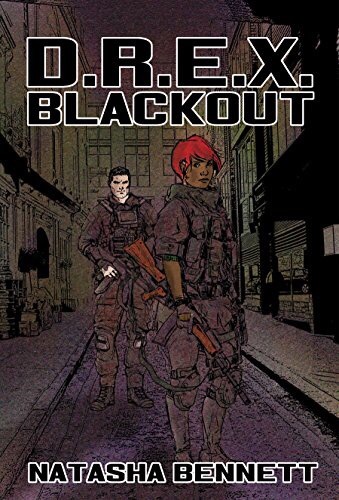 Blackout for yourself, it’s available HERE in both paperback and e-book formats.